Some nurses are choosing to lose their jobs instead of being forced into receiving a vaccine. Others are fighting back by suing the hospital, state, and federal governments for $100,000,000 for trying to take away their constitutional rights. 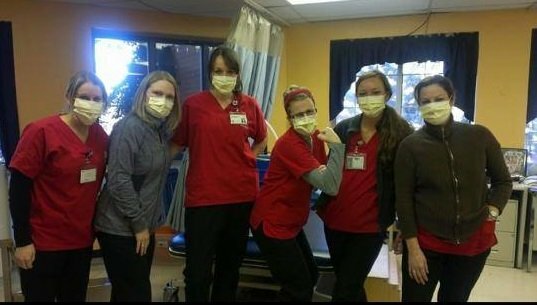 Dr. Karen Sullivan Sibert, herself a pro-vaccine doctor, wrote an opinion piece explaining how requiring nurses to wear masks for refusing the flu vaccination violates HIPAA law for patient privacy. More importantly, it forces our front lines in the healthcare industry to take a concoction with numerous questionable ingredients, including known neurotoxins like aluminum, foreign proteins derived from GM ingredients, and more. There are in fact, more than 22,000 nurses, part of Nurses against Mandatory Vaccines (NAMV), who are refusing mandatory vaccines. NAMV was founded when mandatory vaccines were introduced in the workplace, and though it is not pro-vaccine OR anti-vaccine, it is certainly pro-CHOICE. NAMV members believe that all people should have the right to choose and refuse medical treatment, including nurses and healthcare workers. Why the big push for flu vaccines, anyhow? Publicly available information now shows that hospital systems are REQUIRED to have a 90% or higher flu shot reception rate among their staff, or they lose up to 2% of their funding of Medicare/Medicaid. Conflict of interest? While the government itself does not require mandatory vaccination policies, many if not all are taking an “all or nothing” stance against their workers. Healthcare workers are now facing being fired if they refuse a flu vaccine. Not only is this a human rights violation, it is also an EEOC violation. Furthermore, the response to skewed figures which show that about 30,000 people die from the flu every year are used to muddy the waters. This is only an estimation, with pneumonia and other diseases lumped in together with the flu – there is no vaccine for pneumonia, and most flu strains change before a new vaccine can be made to effectively treat them anyhow. What’s more, the most vulnerable victims are infants and the elderly. Many more people die each year from medical errors, heart disease, diabetes, and other health complications. It is refreshing to see that nurses and other healthcare workers are standing up against forced medical procedures.